BOYNE CITY, MI | April 2, 2019 – Great Lakes Energy (GLE) is exploring the possibility of expanding Truestream fiber internet and voice service to their Boyne service area which includes rural parts of Antrim, Charlevoix, Cheboygan, Emmet and Otsego counties. 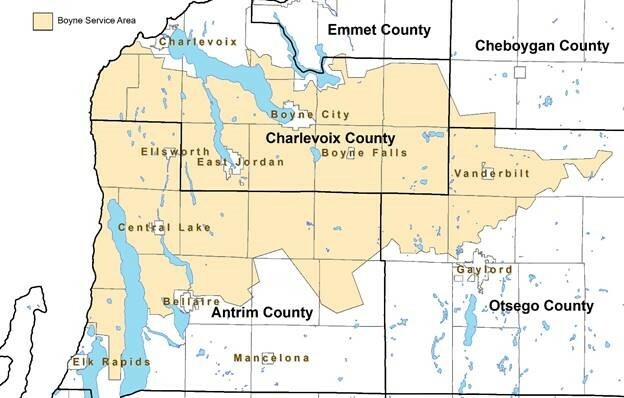 Launched in 2018 in rural parts of Emmet, Charlevoix and Cheboygan counties, the fiber network brings high-speed internet, with speeds up to 1 Gig to homes and business that have long been without broadband connectivity. The fiber network stands to bring massive bandwidth, unlimited voice services, no data caps, and symmetrical speeds up to 1 Gig (1,000 megabits per second) for thousands of homes and businesses served by GLE. Beginning in late March, GLE will deploy field engineers to assess network viability in the Boyne service area (see image below). Contract crews will visit each electric service location to collect meter and other location data. There is no need for contractors to enter member homes. The members themselves, however, will also play a big role in how and where the Truestream network gets developed throughout the Boyne service area. Great Lakes Energy is encouraging those interested in fiber internet to register their interest on jointruestream.com. By voicing their desire to see fiber internet in their community, GLE members help the cooperative understand where to build next in its 26-county service area. GLE is confident the Truestream fiber network will build a better, more connected future for the Boyne area and beyond. Cutline for image: Pictured is the Great Lakes Energy Boyne service area which includes parts of five counties. GLE is studying the expansion of its Truestream fiber internet and voice service in this area to existing member of the electric cooperative.